for valuable articles, videos and other info for the care and training of your parrot. Although not known to be quite as skilled at mimicry as an African grey parrot or Amazon, many eclectus parrots are known to talk. In the Best Talking Parrot Contest, one of the parrots who spoke with great clarity was a male eclectus. Try the DVD Train Your Parrot to Talk to get your Eclectus speaking on cue. In my parrot training workshops I found most eclectus parrots very responsive to food reinforcers. I am usually surprised at the length of time they will continue to respond before satiating. This characteristic makes them wonderful candidates for training. I have worked with eclectus parrots that have responded well to almonds, sunflower seeds and pine nuts. I have also an encountered a few eclectus parrots that enjoy millet spray. This is not usually a treat I offer to larger parrots however it has been successful with eclectus. Be sure all seed and nut treats are broken into small pieces (about the size of a 1/3 of a sunflower seed.) This will ensure many opportunities for your parrot to learn and help limit overindulging in treats. Although often lumped under the heading eclectus parrot, there are actually quite a few subspecies that do look quite different. In general eclectus parrots are not ones that gravitate towards being touched. Many parrots enjoy a good head scratch in which the feathers are stroked towards the beak. Eclectus parrots usually do not respond favorably to this. Eclectus parrots are sexually dimorphic. The males are a brilliant green and the females are purple and red. Because their differences are so extreme, for many years people thought they were two different species. When it comes to eclectus parrots the females rule the roost. They decide when it is time to reproduce. It is said the male is pretty much there to serve her. Some feel this makes male eclectus parrots more easily managed as companion birds versus females. Eclectus parrots have special dietary needs that are a bit different from other parrots. 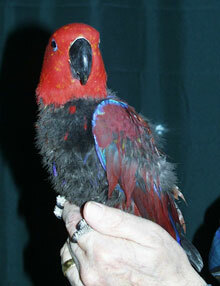 Nutrient deficiencies can lead to problems for these parrots. Be sure to feed a diet that is higher in vitamin A than what is normally required for other parrot species. Toe tapping, which is a condition sometimes observed in eclectus parrots, is possibly the result of dietary issues. However there are other possible causes. You can read more about toe tapping at eclectus breeder Laurella Desborough’s site. Eclectus parrots are one of the species that seems to have a propensity for feather destructive behavior. Unfortunately this can be a very complex problem that often does not have an easy answer. The first response one should take with any feather problem is to visit your avian veterinarian. You can find an avian veterinarian at www.avv.org. For more information on feather destructive behavior here is an excellent article by Tammy Jenkins, DVM on our parrot behavior problems frequently asked questions page. For the most part Eclectus parrots emit pleasant or little sounds. However they are fully capable of producing a loud honk that can be heard at quite a distance. This honk often is presented at full volume and is usually brief. Even so this can be bothersome to some.